This article is about the Battle of Kilkis of 1913. For other battles, see Battle of Kilkis (1944). The Battle of Kilkis–Lachanas took place during the Second Balkan War between Greece and Bulgaria for the town of Kilkis in Macedonia. The battle lasted three days from 19 to 21 June 1913 and ended with a Greek victory. During the night of 16–17 June 1913, the Bulgarians, without official declaration of war, attacked their former Greek and the Serbian allies, and managed to evict the Serbs from Gevgelija, cutting off communication between them and the Greeks. However, they failed to drive the Serbs away from the Vardar/Axios river line. After repulsing the initial Bulgarian attack of 17 June, the Greek army, under King Constantine, advanced with 8 divisions and a cavalry brigade, while the Bulgarians under General Ivanov retreated to the naturally strong defensive position of the Kilkis–Lachanas line. The Bulgarian 2nd Army commanded by General Nikola Ivanov held a line from Lake Dojran south east to Kilkis, Lachanas, Serres and then across the Pangaion Hills to the Aegean. The army had been in place since May, and was considered a veteran having fought at the siege of Adrianople in the First Balkan War. On 16 June 1913 it had about 75,076 men and 175 guns in 57 infantry battalions, 10 cavalry squadrons and 37 batteries. General Ivanov claimed after the war that his Army consisted of only 36,000 men of whom 20,000 were "still untrained" and that many of his units were understrength. The Greek General Staff considerably overestimated the numbers of Bulgarians, reckoning them to be between 80,000 and 105,000. Although General Ivanov probably underestimated the number of his soldiers, he still faced a much larger Greek enemy. The Greek army, commanded by King Constantine I, had 8 divisions and a cavalry brigade (117,861 men) with 176 artillery guns in an 80 km line extended from the Gulf of Orphanos to the Gevgelija area, since it was not possible for the Greek headquarter to know where the Bulgarian attack will take place, giving by necessity the Bulgarian Army the possibility to enjoy temporary local superiority to the chosen for the attack area. The Greek plans were defensive in nature, expecting a Bulgarian attack toward Thessaloniki. As such Thessaloniki was garrisoned by the newly raised Thessaloniki Fortress Command. The Greek divisions deployed forward had the mission to allow the Bulgarians to attack first and while holding their positions as best as they could the Greek army would concentrate the rest of its units for a counterattack on the Bulgarian flank which would be determined as the weakest. The Greek disposition was such: on the Greek left the 10th Infantry Division occupied the area around Axioupoli, an Army Section (disbanded when the war started) with the 3rd and 5th divisions the area between Axios and Gallikos rivers, the 4th Division between Gallikos river and the highway Thessaloniki-Serres, the 1st Division between the lakes Langada and Volvi and the 7th between lake Volvi and the Gulf of Orphanos. The 2nd and 6th divisions were held as reserve north of Thessaloniki, while the Cavalry Brigade was stationed in Sindos west of Thessaloniki. On 15 June the Bulgarian Army took orders to advance towards Thessaloniki. The Greeks stopped them and by 18 June an order for general counterattack was issued for the next day. The 10th division was attacking toward the heights of Kallinovo north of lake Artzan, the 3rd, 5th, 4th and 2nd divisions attacked toward the area of Kilkis, the 6th and 1st toward Lachanas and the 7th toward Karakoli saddle and Nigrita. The Cavalry brigade operated between the 10th and 3rd divisions. At Kilkis the Bulgarians had since long constructed strong defenses, including captured Ottoman guns which dominated the plain below. The area was defended by the Bulgarian 3rd division, minus its 1st brigade. Kilkis itself was garrisoned by the 2nd brigade (colonel Ribarov) of 8 battalions, supported by several artillery batteries. Against them attacked 38 Greek battalions with 100 guns. The 3rd brigade (colonel Kavarnaliev) covered the sector between the Doiran lake and lake Artzan. Following the outbreak of hostilities reinforcements started arriving to the Bulgarian side, initially in the form of the 10th cavalry regiment which covered the flanks of the Kilkis position, and the Serres brigade which started boarding trains on 18 June (O.S.). The Greek divisions attacked across the plain in rushes under Bulgarian artillery fire. On 19 June they overran the Bulgarian forward lines everywhere but suffered heavy losses as the Bulgarian artillery fired incessantly with high accuracy from its excellent obeservation on the hills of Kilkis. The 5th division alone suffered some 1,275 losses on that day. On 20 June, despite having committed all forces and advancing steadily the Greeks failed to break the Bulgarian defence. The Greek Cavalry brigade detected Bulgarian reinforcements arriving by rail. As a result, the Greek HQ ordered the offensive to continue the next morning, while also ordered the 10th division to diengage from the enemy at Kallinovo and send forces southward to participate in the fighting of Kilkis and the 1st and 6th divisions (at the time engaged in the direction of Lachanas) to create a 6-battalion strong detachment plus mountain artillery to reinforce the forces attacking Kilkis on the flank on the next day. Acting under the previous order of the HQ which requested Kilkis be captured by the night of 20 June, the 2nd division attacked alone in the night. During the night of 20 to 21 June, following an artillery fire exchange, two regiments of the 2nd division crossed Gallikos river and attacked piercing successively the 1st,2nd and 3rd defensive lines of the Bulgarians entering the town of Kilkis by the morning of 21 June. In the morning the rest of the divisions joined the attack and the Bulgarians retreated to the north, where the Greeks pursued them but in short depth due to exhaustion, allowing the Bulgarians to break contact. 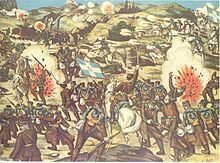 In the three days battle around Kilkis the Greeks had suffered heavy casualties totalling 5,652 killed and wounded. A further 276 killed and wounded were suffered by the 10th division which had captured Gevgelia on 20 June and the hills of Kallinovo in the afternoon of 21 June. About 500 Bulgarian soldiers, 3 guns and many rifles had been captured. Like the area of Kilkis, the Bulgarians has also prepared the area of Lachanas with defensive works. The hills around Lachanas dominated the area with excellent fields of fire. The Greek 6th division attacked on 19 June from Assiros (Yuvesna) toward the direction of Lachanas and succeeded after losing some 530 men to capture the line Dichalo-Klepe. The 1st division advanced from the south and successfully captured Vertiskos. On 20 June the two Greek divisions advanced further and joined their flanks while they made contact with the main Bulgarian defensive location of Lachanas despite the fire from the Bulgarian artillery. In the night of 20–21 June the order from HQ to create a detachment to hold the forces attacking Klkis arrived and the relevant orders were given. In the morning of 21 June the Bulgarian concentrated artillery fire on the 5th regiment. Observing the IIIrd battalion withdrawing, to participate in the forming detachment for Kilkis, the Bulgarians saw an opportunity and attacked the Ist battalion forcing it to retreat with heavy losses. A counterattack with the IInd battalion led by the regiment commander stopped the Bulgarians. Following the fall of Kilkis in the morning, the order for the formation of the detachment was cancelled. At 15:00 the two Greek divisions attacked the Bulgarian position in close coordination with artillery and by 16:00 had broken the Bulgarian defence, which seemed taken aback following its morning success against the I/5. The Bulgarians retreated in disorder leaving 16 guns and 500 prisoners in the hands of the Greeks. Meanwhile, the Greek 7th division had been fighting on the far east flank. On 19 June it successfully captured the saddle of Karakoli, however on 20 June even though it faced no resistance it advanced slowly toward Nigrita which it captured. A Bulgarian force consisting of regimental staff and one battalion was advancing aggressively toward Karakoli. It was encircled and surrendered with 10 officers and 1500 men. On 21 June the division continued its slow advance. Even though it was informed of the Bulgarian defeat and retreat over Orliako bridge, its columns advanced too slowly to block the Bulgarians. The division was heavily criticized for its unacceptable failure. The two Greek divisions suffered 2,701 killed and wounded at Lachanas and the 7th division suffered a further 199 in its fights. The defeat of the 2nd Army by the Greeks was the most serious military disaster suffered by the Bulgarians in the 2nd Balkan war. Bulgarian sources are giving a total of 6,971 casualties. To these Greeks suffered 8,828 casualties. On the Bulgarian right Evzones captured Gevgelija and the heights of Matsikovo. As a consequence the Bulgarian line of retreat through Doiran was threatened and Ivanov's army began a desperate retreat which at times threatened to become a rout. Reinforcements came too late and joined the retreat towards Strumica and the Bulgarian border. The Greeks captured Dojran on 5 July but were unable to cut off the Bulgarian retreat through Struma Pass. On 11 July the Greeks came in contact with the Serbs and then pushed on up the Struma River until they reached Kresna Gorge on 24 July. The casualties and losses of the battle were of the heaviest in the modern Greek military history. However, the conclusion was a triumph for the Greeks and boosted the popularity of the new King. Due to its significance for the Greeks, the Battle of Kilkis gave its name to a Greek battleship, the Kilkis, in 1914. The battle is also commemorated at the Kilkis War Museum and the Battle of Lahanas Museum. This page was last edited on 15 December 2018, at 13:50 (UTC).